6220: Mystery Radio @ 20.33. SINPO 44444. Playing Wham "Last Christmas". ID given at 20.35 UTC. 6925: Spider Radio (USB) (tent) @ 20.29. SINPO 43333. Playing U2 "Angel of Harlem". Left you can see my Reflections Europe QSL card I got today. Thanks Trevor ! 6205: UNID station @ 12.47. SINPO 44454. 6220: Mystery Radio @ 13.04. SINPO 44444. Italian language relayed programme. 6290: UNID station @ 12.39. SINPO 33343. Signing off at 12.46. 6295: Reflections Europe - Radio Fax (presumably) - religious programming @ 15.43. SINPO 34232. 6376,60: UNID station @ 12.55. SINPO 322222. 6870: Radio Playback @ 13.00. SINPO 43343. 7550: Radio Amica @ 13.08. SINPO 33233. 12255: Reflections Europe - Radio Fax (presumably) - religious programming @ 15.10. SINPO 33223. 6220: Mystery Radio @ 13.33. SINPO 34333. 6295: Radio Fax (presumably) relaying religious programming @ 17.04. SINPO 33232. 6870: Radio Playback @ 13.44 & 14.38. SINPO 34343 & 43343. 7550: Radio Amica @ 14.20-17.14 (checked four times during that time). SINPO 43443 up to 54444. 12255: Radio Fax (presumably) relaying religious programming @ 14.57 & 16.50. SINPO 33232 & 23122. 1652,80: UNID station (russian pirate ?) @ 16.39. SINPO 23232. 1741,60: UNID station (russian pirate ?) @ 16.25. SINPO 33233. 3901: UNID station @ 22.16. SINPO 33333. At 22.18 off the air. 3920: UNID station @ 22.11. SINPO 44444. Strong signal. Mood nice music. Playing "Bangkok" at 22.16. Mentioning Skyline Radio. 6220: Mystery Radio (tent) @ 22.18. SINPO 44444. 6870: Playback Radio @ 13.13. SINPO 43343. Old US station tapes seemed to be broadcast. 3900: Radio Spaceman @ 19.30. SINPO 44444. Still on air at 20.30. Good signal as usual. 6220: Radio Mystery @ 21.15. SINPO 55444. non-live playlist broadcast. Nice music. Good signal as always. 6925: Spider Radio (USB) @ 20.32. SINPO 33233. 3925: Voice of the Netherlands (thanks to UK DXer for comment) @ 22.15. SINPO 33232. A station playing heavy metal music. 3910: Radio Spaceman @ 18.45. SINPO 43443. 6220: Radio Mystery (tent) @ 18.48. SINPO 33223. 3900: UNID station @ 19.11. SINPO 44444. Dutch station, suprisingly good signal today in 76 mb here. Closing down at 19.26 UTC. 3900: Skyline International (tent) @ 19.29. SINPO 43444. Closed down soon at 19.32. Seems to be the same station as the one I heared as of 19.11 UTC on 3900 kHz. 6220: Mystery Radio @ 19.12. SINPO 44444. 6325: UNID station @ 18.45. SINPO 32222. Seem to be off the air at 19.10 UTC. 6220: Mystery Radio @ 21.27. SINPO 44344. 6310: Radio Spaceman (tent) @ 21.18. SINPO 43443. Some thunderstorm cracks disturbing reception. 6380: Shortwave Combination Holland (tent) @ 21.30. SINPO 43443. Some teletype and storm cracks here. 6870: Playback Radio @ 21.26. SINPO 33343. Now different programming than on 6220 kHz (earlier same audio stream). 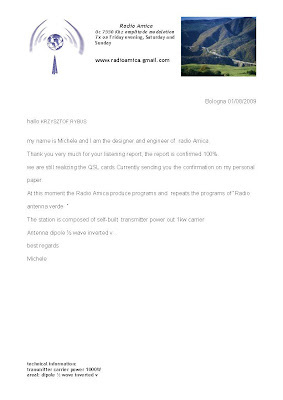 Here is a QSL letter from Radio Amica. Thank you ! 6870: Radio Playback @ 07.19. SINPO 34333. 7550: Radio Amica @ 07.20. SINPO 43444. Woman voice announcement about experimental transmission by Radio Amica on this frequency. Good signal still at 09.00 UTC.